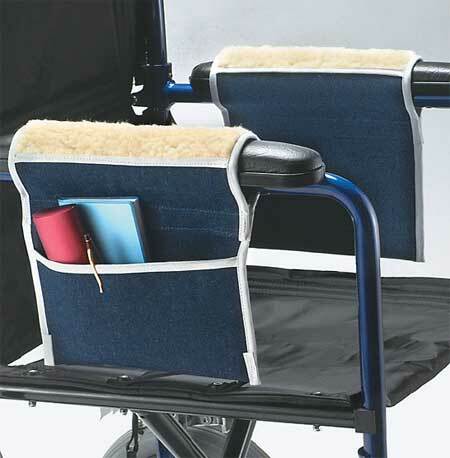 Prevents the user's feet from slipping behind the wheelchair foot rest. Foot pads raise footrests from 1 to 4 inches. 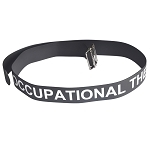 Helps improve posture and promote proper seating alignment. 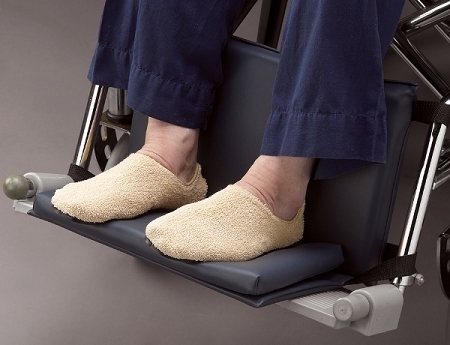 The Posey Leg and Foot Hugger is a calf support and foot cushion that provides proper leg positioning to increase comfort and prevent foot drop. 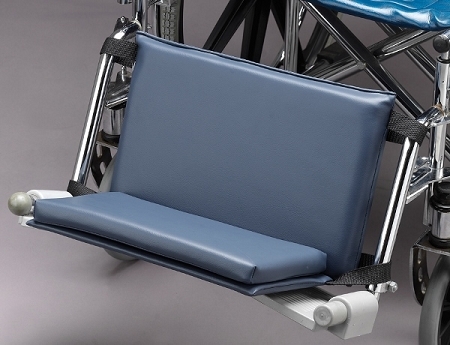 Wheelchair users who need lower extremity support or cushioned leg support will find these leg and foot positioning aids helpful for preventing their feet from slipping behind the wheelchair foot rests. 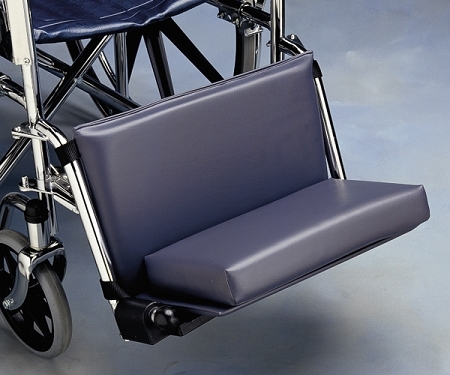 The Posey Leg and Foot Hugger combines an elevated footrest and leg rest to provide comfortable leg and foot support. 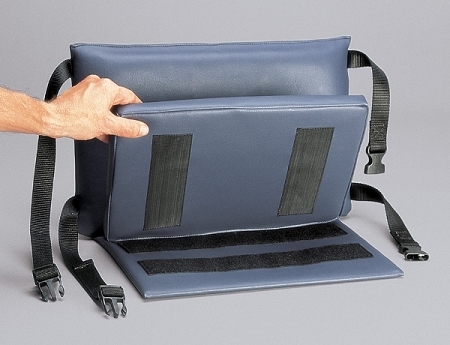 Cushions attach to footrest and leg rest quickly and easily with hook-and-loop straps. 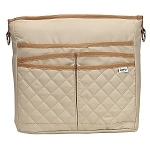 The foam padded cushions are covered with wipe-clean vinyl. The Leg Hugger provides lower leg support and helps prevent feet from slipping behind the footrests or becoming tangled in the chair. The leg cushion measures 15½ inches wide, 9 inches high and mounts flush with footrest hangers to allow full use of the footrest. 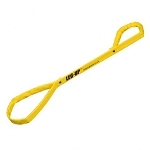 The Foot Hugger is available in 1 inch, 3 inch and 4 inch heights. 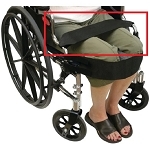 The Posey Leg and Foot Hugger secures with quick release straps and fits 18 to 20 inch wheelchairs. 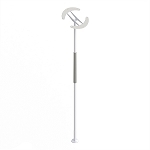 Leg Hugger with 1 inch Foot Hugger #CPO6351 measures 13 inches wide, 9 inches deep, 1 inches high. Leg Hugger with 3 inch Foot Hugger #CPO6353 measures 13 inches wide, 9 inches deep, 3 inches high. Leg Hugger with 4 inch Foot Hugger #CPO6354 measures 13 inches wide, 9 inches deep, 4 inches high. Fits: 18 to 20 inch wheelchairs. Materials: Foam padding covered with vinyl. The pair were fine. I ordered the foot hugger height too tall (3 inches) so be careful. I was going from memory and although she is only 5'2, with her shoes on, her knees were up too tall. The nursing home is not very gentle with the products, so I wish they weren't quite so pricey and attached a little easier, but they do work as advertised. Q: Is the hugger flexible, ie will it stand up to pressure of the leg or foot pushing on it? A: Yes, it's secured to the wheelchair with hook-and-loop straps. Q: I ordered what I thought was a foot Hugger combination but received only the leg board P/N 6135. I need the two part configuration to protect my wife's feet. Will P//N CPO as on the diadram provide both parts? A: Yes, The Posey Leg and Foot Hugger combines an elevated footrest and leg rest to provide comfortable leg and foot support.